Ilyá Yefímovich Répin (Илья́ Ефи́мович Ре́пин) (August 5, 1844, Ukraine – September 29, 1930, Kuokkala, Finland) was a leading Russian painter and sculptor of the Peredvizhniki artistic school. His realistic works often expressed great psychological depth and exposed the tensions within the existing social order. Like other art forms in late nineteenth century Russia, the content became more realistic and more focused on social concerns, expressing the hopes of the people for greater justice and equality. After the Russian Revolution of 1917, this tradition of realism was adopted by the government and re-interpreted as the basis for Socialist realism. Beginning in the mid-1920s, a Repin cult was established in the Soviet Union; he was held up as a model "progressive" and "realist" to be imitated by Socialist Realist artists in the USSR. Repin was born in the town of Chuguev near Kharkov in the heart of the historical region called Sloboda Ukraine. His parents were Russian military settlers. In 1866, after apprenticeship with a local icon painter named Bunakov and preliminary study of portrait painting, he went to Saint Petersburg and was shortly admitted to the Imperial Academy of Arts as a student. From 1873 to 1876 on the Academy's allowance, Repin sojourned in Italy and lived in Paris, where he was exposed to French impressionist painting, which had a lasting effect upon his use of light and color. Nevertheless, his style was to remain closer to that of the old European masters, especially Rembrandt, and he never became an impressionist himself. 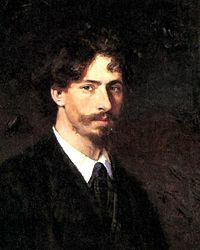 Throughout his career, he was drawn to the common people from whom he traced his origins, and he frequently painted country folk, both Ukrainian and Russian, though in later years he also painted members of the Imperial Russian elite, the intelligentsia, and the aristocracy, including Tsar Nicholas II of Russia. In 1878, Repin joined the free-thinking "Association of Peredvizhniki Artists," generally referred to as "the Wanderers" or "The Itinerants" in English. The Peredvizhniki were a group of Russian realist artists who in protest to academic restrictions formed an artists' cooperative which evolved into the Society for Traveling Art Exhibitions in 1870. The society formed in 1870 in St. Petersburg under Ivan Kramskoi, G.G. Myasoedov, Nikolai Ge and Vasily Perov's initiative during a struggle of the avant-garde art forces of the country for democratic ideals, and in a counterbalance to the official center of art—the St.Petersburg Academy of Arts. The society developed the best traditions of the Artel of Artists headed by Kramskoi, who became the leader of the new association. From 1871 to 1923 the society arranged 48 mobile exhibitions in St.Petersburg and Moscow, after which they were shown in Kiev, Kharkov, Kazan, Orel, Riga, Odessa and other cities. The Peredvizhniki’s society, during their blossoming (1870-1890), developed an increasingly wider scope, and increasing naturalness and freedom of the images. In contrast to the traditional dark palette of the time, they chose a freer, wider manner with a lighter palette in depicting light. They aimed for naturalness in their images, and depiction of people’s relationship with their surroundings. Their art showed not only poverty but also the beauty of folk way of life; not only suffering but also fortitude, strength of characters. Repin arrived in the capital at about the time the movement began to take off. His fame was established by his painting of the "Volga Barge Haulers," a work which portrayed the hard lot of these poor folk but which was not without hope for the youth of Russia. From 1882 he lived in Saint Petersburg but frequently visited his Ukrainian homeland and on occasion made tours abroad. 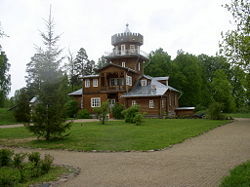 Repin's countryhouse in Zdravnevo, Belarus. Beginning shortly before the assassination of Tsar Alexander II of Russia in 1881, he painted a series of pictures dealing with the theme of the Russian revolutionary movement: "Refusal to Confess," "Arrest of a Propagandist," "The Meeting," and "They did not Expect Him," the last of which is undoubtedly his masterpiece on the subject, mixing contrasting psychological moods and Russian and Ukrainian national motifs. 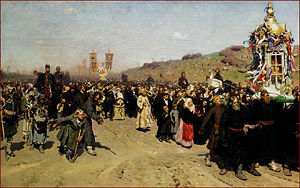 His large-scale "Religious Procession in the Province of Kursk" is sometimes considered an archetype of the "Russian national style" displaying various social classes and the tensions among them set within the context of a traditional religious practice, united by a slow but relentless forward movement. In 1885, Repin completed one of his most psychologically intense paintings, "Ivan the Terrible and his Son." This canvas displayed a horrified Ivan embracing his dying son, whom he had just struck and mortally wounded in an uncontrolled fit of rage. The visage of terrified Ivan is in marked contrast with that of his helpless son. 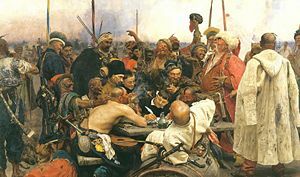 One of Repin's most complex paintings, "The Reply of the Zaporozhian Cossacks to Sultan of Turkey" occupied many years of his life. He conceived this painting as a study in laughter, but also believed that it involved the ideals of liberty, equality, and fraternity; in short, Ukrainian Cossack republicanism. Begun in the late 1870s, it was only completed in 1891, and, ironically, was immediately purchased by the Tsar. The Tsar paid 35,000 rubles for the painting, the largest amount ever paid for a Russian painting to that time. During his maturity, Repin painted many of his most celebrated compatriots, including the novelist Leo Tolstoy, the scientist Dmitri Mendeleev, the imperial official Konstantin Pobedonostsev, the composer Modest Mussorgsky, the philanthropist Pavel Tretyakov, and the Ukrainian poet and painter, Taras Shevchenko. In 1903 he was commissioned by the Russian government to paint his most grandiose design, a 400 x 877 cm canvas representing a ceremonial session of the State Council of Imperial Russia. Repin himself designed his home Penaty (literally, "the Penates"), located just to the north of Saint Petersburg. After the Russian Revolution of 1917, Penaty was incorporated into Finland. He was invited by Vladimir Lenin to come back to Russia but refused the invitation, using the excuse that he was too old to make the journey. With the exception of a portrait of Provisional Government head, Alexander Kerensky, he never painted anything substantial on the subject of the 1917 revolutions or the Soviet experiment that followed. His last painting, "The Hopak," was on a Ukrainian Cossack theme. In 1930, he died in Kuokkala, Finland (now Repino, Leningrad Oblast). The Penates are part of the World Heritage Site Saint Petersburg and Related Groups of Monuments. In 1940, Penaty was opened for the public as a house museum. Alexander Glazunov's Oriental Rhapsody, Op. 29 (1889) is dedicated to Ilya Repin. Sternin, Grigory, and others. Ilya Repin: Painting Graphic Arts. Leningrad: Aurora, 1985. History of "Ilya Yefimovich Repin"
This page was last modified on 26 February 2018, at 00:19.